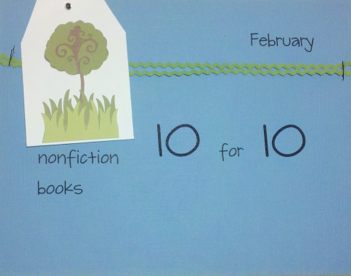 Today is the annual Nonfiction Picture Book 10 for 10, hosted by Cathy Mere from Reflect and Refine, Mandy Robek of Enjoy and Embrace Learning, and Julie Balen of Write at the Edge. This is my third year participating in this event, which provides me with a chance to expand my nonfiction TBR list. Last year I created a list of ten picture books I hoped Isabelle would embrace as she got older. Since she’s much more into narratives these days (She’s three! ), I decided to create another list of ten picture books I hope she’ll embrace as she becomes more interested in nonfiction books. I believe in the mission of the We Need Diverse Books Campaign. All students deserve to read mirror books, in which they can see themselves, and window books, in which they can learn about others. This means we must have books that represent a variety of religious backgrounds, races, and sexual orientations on classroom bookshelves during all months of the year. Publisher’s Summary: Each day features a different influential figure in African-American history, from Crispus Attucks, the first man shot in the Boston Massacre, sparking the Revolutionary War, to Madame C. J. Walker, who after years of adversity became the wealthiest black woman in the country, as well as one of the wealthiest black Americans, to Barack Obama, the country’s first African-American president. With powerful illustrations by Shane Evans, this is a completely unique look at the importance and influence of African Americans in the history of this country. Mentor Text Possibilities: How do you take a large topic and teach someone about it in a meaningful way? We ask students to narrow their focus. We teach them to select main and subordinate ideas using tools like boxes and bullets to facilitate this work. In 28 Days, Smith took a large topic (i.e., African-American history) and made it accessible by focusing on important people. He set up 28 Days in chronological order and combined prose and poetry to highlight extraordinary events and people who are part of African-American history. Studying the way Smith took an enormous topic and focused on specific moments in time is worthy of close study alongside students. Every day of the 28 days (Plus there’s a bonus poem on Day 29, which is relevant when using this book during a leap year.) is structured in a unique way. The book includes a eulogy (for Madam C.J. Walker), a Supreme Court decision (for Brown v. Board of Education), an acrostic poem (for Malcolm X), an oath of office (for Thurgood Marshall), and a reverse countdown (for Guy Bluford and Mae Jemison). There is a structure worthy of close study with all students. 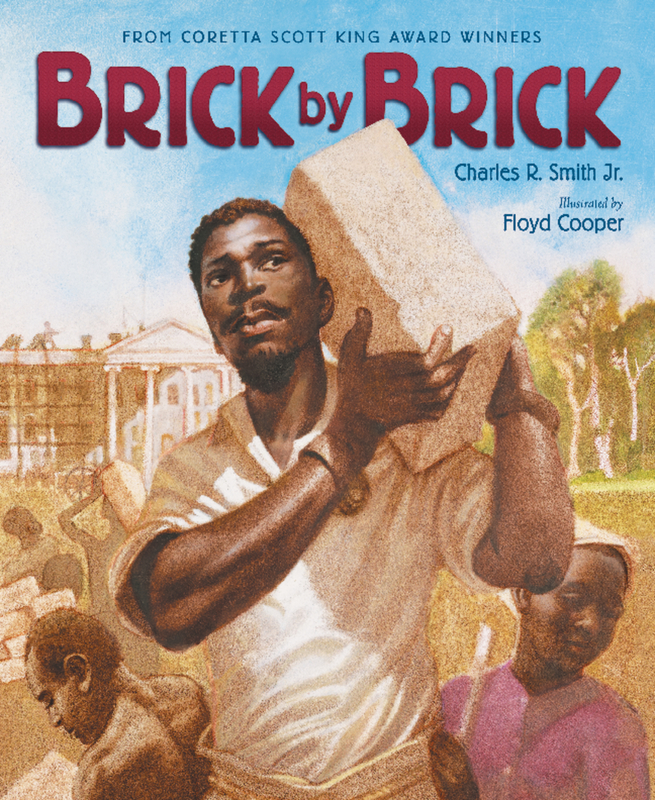 Publisher’s Summary: Coretta Scott King Award-winners Charles R. Smith Jr. and Floyd Cooper deliver the compelling story behind the building of the White House, a powerful part of history rarely taught. The home of our president was built by many hands, several of them slaves’, who undertook this amazing achievement long before there were machines to do those same jobs. With an insightful author’s note and a list of selected resources, this book supports the Common Core State Standards. Stirring and emotional, Cooper’s stunning illustrations bring to life the faces of those who endured hard, brutal work when the profit of their labor was paid to the master, not the slave. The fact that many were able to purchase their freedom after earning money from learning a trade speaks to the strength of those individuals. They created this iconic emblem of America, brick by brick. Mentor Text Possibilities: When it comes to content-area writing, we can encourage students to tell little-known stories. This book’s topic (i.e., slaves building the white house) is one of those parts of history we don’t learn in textbooks, but is worthy of being told. We can expand students’ topic choices when we show them books like Brick by Brick . There are other things I admire about this text, which can be used when working with students. First, the word choice is exceptional. It’s precise, which makes every ounce of this text come alive in a reader’s mind. In addition, end rhyme, repetition, and list-like writing abound throughout this book. Publisher’s Summary: Caldecott Honor artist Faith Ringgold takes readers on an unforgettable journey through the Harlem Renaissance when Lonnie and his uncle Bates go back to Harlem in the 1920s. Along the way, they meet famous writers, musicians, artists, and athletes, from Langston Hughes and W.E.B. Du Bois to Josephine Baker and Zora Neale Hurston and many more, who created this incredible period. And after an exciting day of walking with giants, Lonnie fully understands why the Harlem Renaissance is so important. 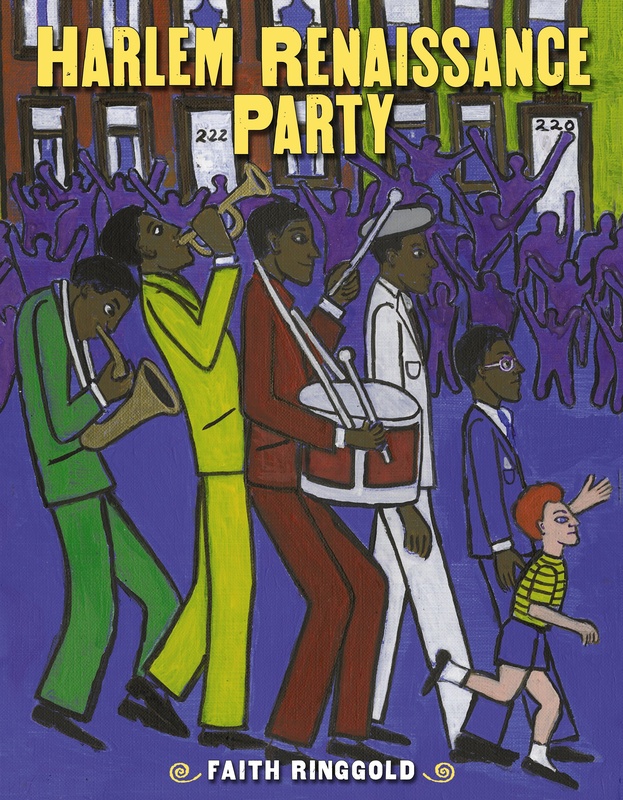 Faith Ringgold’s bold and vibrant illustrations capture the song and dance of the Harlem Renaissance while her story will captivate young readers, teaching them all about this significant time in our history. A glossary and further reading list are included in the back of the book, making this perfect for Common Core. Mentor Text Possibilities: Like 28 Days, Harlem Renaissance Party tackles a large subject in an unique way. Lonnie and his Uncle Bates journey back to Seventh Avenue in Harlem to meet the greats of the Harlem Renaissance. Ringgold introduces readers to the greats from this time period by employing rich setting details, character descriptions, and dialogue. Any child who is attempting to write about a topic like the Harlem Renaissance, would benefit from a close study of Ringgold’s book. This book can inspire students to introduce their readers to important people and placesfrom a time period in a different way. There’s a four page glossary that provides readers with more information on everything in the book. Things like the Charleston and the Fox-Trot are defined. Information about people like Zora Neale Hurston and Paul Robeson are also found in the glossary. Places like the Harlem Opera House, the Savoy Ballroom, and the Shomburg Library are also explained. A glossary like the one in the back of Ringgold’s book can be another way for young writers to showcase their knowledge about the time period about which they’re writing. On August 28, 1963, on the steps of the Lincoln Memorial during the March on Washington, Martin Luther King gave one of the most powerful and memorable speeches in our nation’s history. His words, paired with Caldecott Honor winner Kadir Nelson’s magnificent paintings, make for a picture book certain to be treasured by children and adults alike. 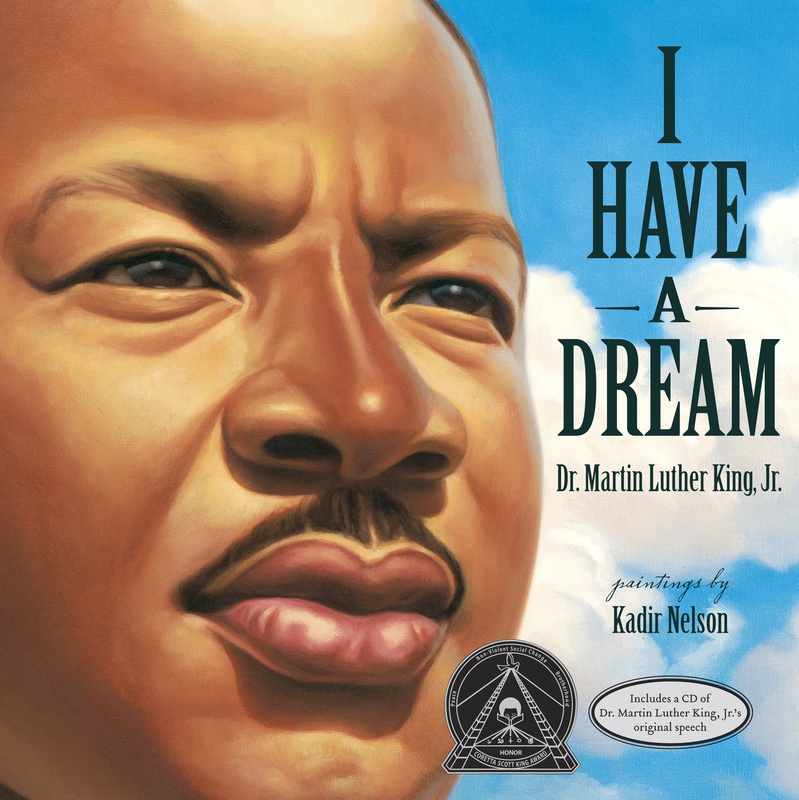 The themes of equality and freedom for all are not only relevant today, 50 years later, but also provide young readers with an important introduction to our nation’s past. Included with the book is an audio CD of the speech. Mentor Text Possibilities: Are your students writing a speech? Have them study King’s speech. Are you teaching a lesson on memoir? Teach a lesson on refrains using this speech as a mentor text. For more ideas, read my original review of I Have a Dream, which I wrote in January 2013. 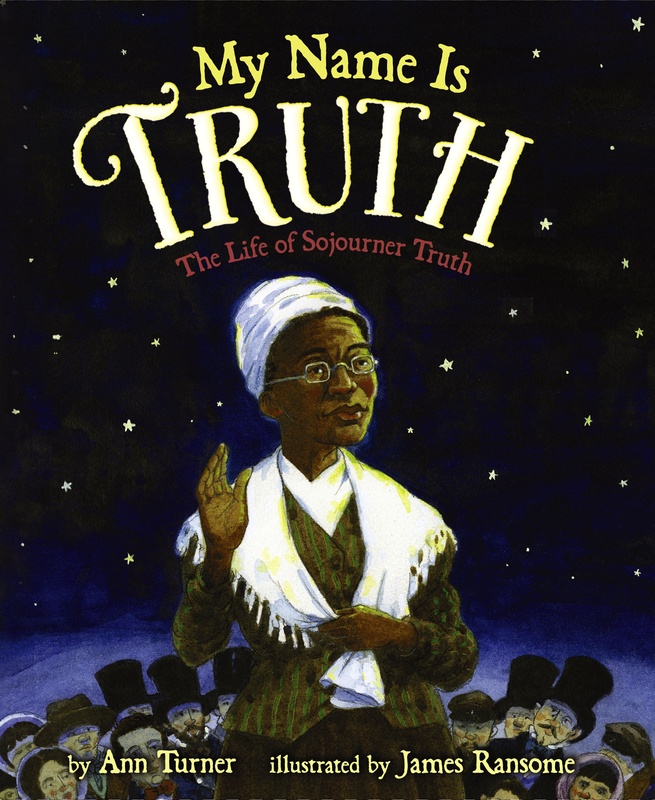 Publisher’s Summary: Here is the remarkable true story of how former slave Isabella Baumfree transformed herself into the preacher and orator Sojourner Truth, as told by acclaimed author Ann Turner and award-winning illustrator James Ransome. An iconic figure of the abolitionist and women’s rights movements, Sojourner Truth famously spoke out for equal rights roughly one hundred years before the civil rights movement. This beautifully illustrated and impeccably researched picture book biography underwent expert review by two historians of the period. My Name Is Truth includes a detailed historical note, an archival photo, and a list of suggested supplemental reading materials. Written in the fiery and eloquent voice of Sojourner Truth herself, this moving story will captivate readers just as Sojourner’s passionate words enthralled her listeners. Mentor Text Possibilities: This book is a biography that feels like an autobiography since it’s written in the first person, but not by Sojourner Truth. (Rather, it’s written by Ann Turner.) It can surely be used alongside other biographies in order to talk with students about the characteristics of the genre. My Name is Truth allows readers to hear the subject’s voice. This can help us teach students how to weave primary source documents (e.g., speeches, diary entries) into their writing to make it feel as though the writing is coming alive with the profiled person’s voice. The author’s note in My Name is Truth is one of the longer ones I’ve seen. It provides an excellent history about Sojourner Truth’s life. If you’re teaching students to craft author’s notes, this is one worth studying. Publisher’s Summary: Something different was happening in Huntsville. For the citizens of that city, creativity, courage, and cooperation were the keys to working together to integrate their city and schools in peace. In an engaging celebration of this lesser-known chapter in American and African-American history, author Hester Bass and illustrator E. B. Lewis show children how racial discrimination, bullying, and unfairness can be faced successfully with perseverance and ingenuity. Mentor Text Possibilities: I loved the way Seeds of Freedom was written. There is so much we can teach young writers to emulate by studying this book. There’s content-specific vocabulary, varied sentence lengths, an excellent author’s note, headings (in the form of dates), precise words, and lots of punctuation that creates voice. The story of the peaceful integration of Huntsville isn’t one that’s heard very often. In fact, the way the city was integrated was quite remarkable. Like Brick by Brick, using Seeds of Freedom is another book we can show students about the power of sharing a little-known story about a time period. Dana reviewed this book in-depth yesterday. 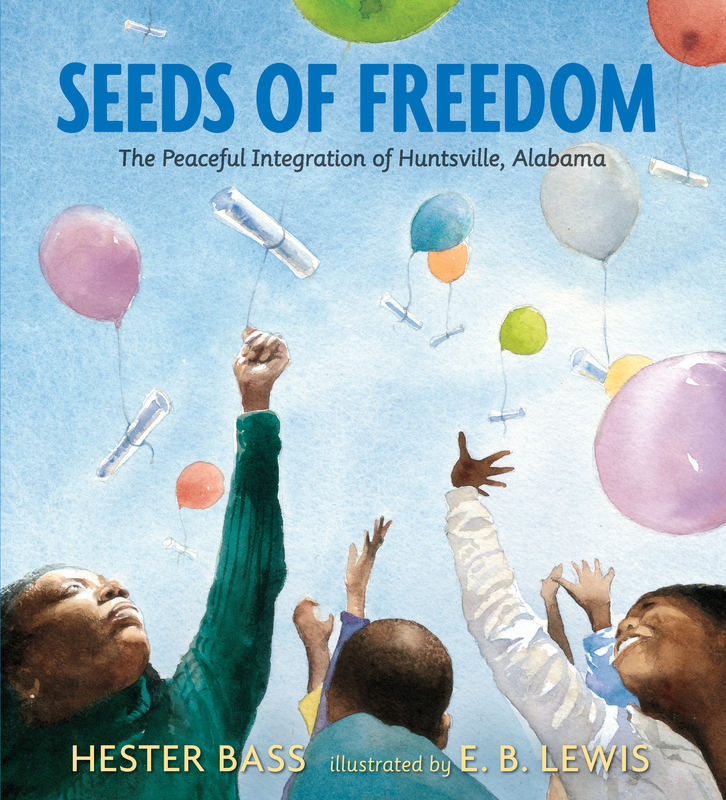 Click here to view her recommendations about how to use Seeds of Freedom as a mentor text. Publisher’s Summary: John Roy Lynch spent most of his childhood as a slave in Mississippi, but all of that changed with the Emancipation Proclamation. Suddenly people like John Roy could have paying jobs and attend school. While many people in the South were unhappy with the social change, John Roy thrived in the new era. He was appointed to serve as justice of the peace and was eventually elected into the United States Congress. This biography, with its informative backmatter and splendid illustrations, gives readers an in-depth look at the Reconstruction period through the life of one of the fi rst African-American congressmen. Mentor Text Possibilities: Like Seeds of Freedom, this book is also crafted with strong voice, which makes it worthy of studying. Sometimes the voice is created with variations in the print (e.g., italics). While many sentences tend to be longer, there are some places with short sentences which cause readers to pause. Often punctuation is used to create voice. For instance, Barton often uses dashes, instead of commas, emphasize, interrupt, or change thoughts in the middle of sentences. Barton also used dashes to create longer or more dramatic pauses in sentences. This picture book is 50 pages long, which means there are LOTS of things you can study alongside students in order to figure out what makes this text work well. The back matter in this book is plentiful. It includes a two-page timeline of John Roy Lunch’s life and the state and national events that took place during his lifetime. Also included are an author’s note, illustrator’s note, historical note, maps, and a bibliography for further reading. 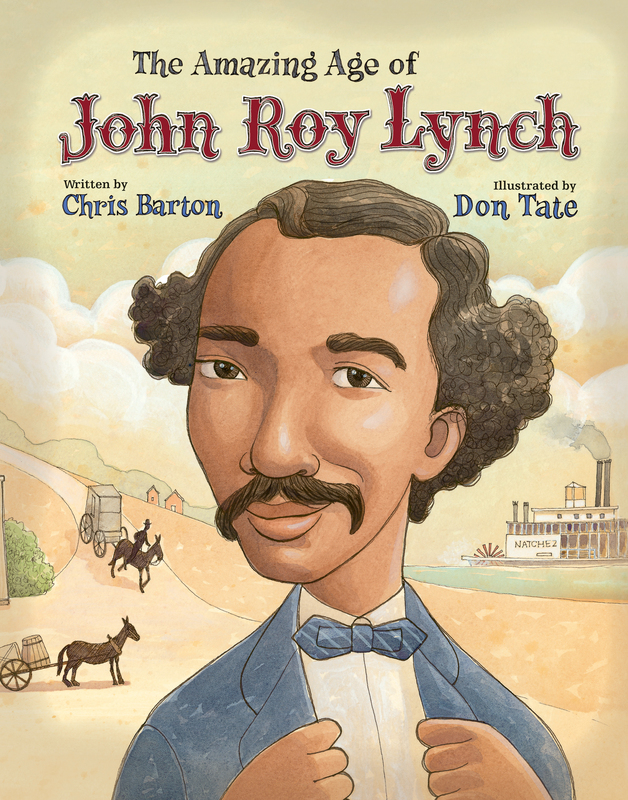 If your students are writing biographies, or doing any kind of informational writing which might benefit from back matter, study The Amazing Age of John Roy Lynch. Publisher’s Summary: The strength and spirit of Dr. Martin Luther King, Jr. permeates this picture book about the funeral of Dr. King in Atlanta, Georgia, in 1968. Quiet, yet affecting, THE CART THAT CARRIED MARTIN is a unique tribute to the life of a man known world-wide for his outstanding efforts as a leader of the African-American Civil Rights Movement. Eve Bunting focuses on the funeral procession of Dr. King, beginning with the two men who found the cart to carry him through the streets of Atlanta. After painting it green, two mules named Belle and Ada are hitched to the cart where Dr. King’s coffin is placed. Tens of thousands of mourners gather as the cart makes its way to Ebenezer Baptist Church, and then past the Georgia state capitol to Morehouse College. All the while, crowds of people pay their respects by singing songs of hope. Mentor Text Possibilities: Eve Bunting’s writing always gives me goosebumps. Sometimes the chills. The Cart That Carried Martin gave me goosebumps and chills because it is so good. The book leaves you with a heavy heart. And, like so many of Bunting’s books, makes you feel something so deep, it’s almost indescribable. Like all of Bunting’s books, this one is laden with excellent craft moves we can teach students to make as when they’re writing. This book is not your typical book about Dr. King. Instead it’s a book about the cart that carried his coffin on the day of his funeral. It serves as an example of how a writer chose to write about an artifact that had so much meaning at the time. Publisher’s Summary: A family silently crawls along the ground. They run barefoot through unlit woods, sleep beneath bushes, take shelter in a kind stranger’s home. Where are they heading? They are heading for freedom by way of the Underground Railroad. Mentor Text Possibilities: Sometimes less is more. That is the case with Evans’ Underground, which has short amounts of text and captivating illustrations. We can teach students, by using Underground as a mentor, the importance of selecting just the right words and the impact short sentences and fragments can have on a text. Publisher’s Summary: In moving verse, Children’s Poet Laureate J. Patrick Lewis gives new voice to seventeen heroes of civil rights. Exquisitely illustrated by five extraordinary artists, this commanding collection of poems invites the reader to hear in each verse the thunder that lies in every voice, no matter how small. Featuring civil rights luminaries Coretta Scott King, Harvey Milk, Mohandas Gandhi, Nelson Mandela, Sylvia Mendez, Aung San Suu Kyi, Mamie Carthan Till, Helen Zia, Josh Gibson, Dennis James Banks, Mitsuye Endo, Ellison Onizuka, Jackie Robinson, Muhammad Yunus, James Chaney, Andrew Goodman, and Michael Schwerner. Mentor Text Possibilities: The tone of this book “somber and inspirational” (Retrieved from Kirkus Reviews on 2/9/15. 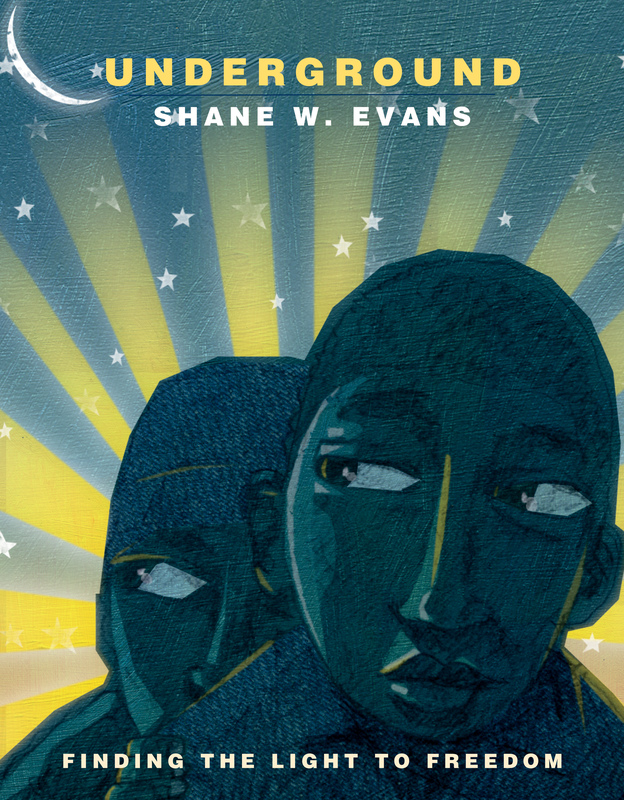 ), which makes it an ideal mentor text for any child tackling a complex topic like the civil rights movement. Writers can emulate J. Patrick Lewis’s voice as they craft poems of their own about historical figures or events. I reviewed this book in 2012. Click here to discover more ways to use it and to take a look inside. Still want more? Check out the Brooklyn Public Library’s Black History Month book recommendations. Leave a comment on this post for a chance to win one of these picture books. Several publishing houses are giving away one copy of each book listed above. Many thanks to Candlewick Press, Charlesbridge, Chronicle Books, Eerdmans, HarperCollins, Macmillan, Random House for donating a copy for TWT readers. For a chance to win this copy of one of the titles above, please leave a comment about this post by Thursday, February 26th at 11:59 p.m. EST. I’ll use a random number generator to pick the winners, whose names I will announce at the bottom of this post, by Friday, February 27th. I will draw the winners’ names and assign the books at random unless you state, in your comment, which books you’re most interested in using in your classroom and why. Preference will be given to those (whose names are chosen) who mention specific titles in their comments. Some publishers only ship books to people in the United States, while others will ship worldwide. Please leave your geographic location, if you do NOT live in the United States and/or have a U.S. mailing address, when you leave a comment. Listing the name of the book does not guarantee you’ll win a copy of it if your name is one of the ten chosen since multiple people might request the same book(s). If you are the winner of the book, I will email you with the subject line of TWO WRITING TEACHERS – NFPB10FOR10. Please respond to my e-mail with your mailing address within five days of receipt. Unfortunately, a new winner will be chosen if a response isn’t received within five days of the giveaway announcement. Comments are now closed (2/27/15). Thank you to everyone who left a comment about these books. What a comprehensive list! Thanks for sharing it. I’ve only read the Sojourner Truth and I Have A Dream books thus far. Brick by Brick looks very powerful. Looking forward to checking out these titles! So many good books to add, as resources, as exposure, as descriptions of what has been and what could be. Thank you for sharing! What a great list of books! I own a few of these, but I’d be happy to win any of them…they all would be great additions to my school library! Thanks! What a great giveaway! These look like great books. I love the mentor text possibilities that you listed! Thanks so much! I love these book recommendations. I just looked at the titles via Amazon and each book is so strong and delivers a great message. Teaching history through well told stories is an amazing way to reach kids. Loved reading this post; we’re engaging in lots of conversations about window and mirror books at our school right now ourselves. Seeds of Change, When Thunder Comes, or The Cart that Carried Martin are of particular interest, but I’d be happy to add any of these titles to our classroom libraries! So many great suggestions! I am excited to see Eve Buntings book as I love everything she writes. Also excited about Brick by Brick and Seeds of Freedom. My amazon list just keeps getting longer! I loved reading through this list of books. Some are favorites of mine–The Cart That Carried Martin and Underground. Ones that I would be excited to win are My Name is Truth or Brick by Brick. I am also very intrigued by the 28 Days book. It would be a great addition to morning meetings with my students! Kadir Nelson’s artwork in I Have a Dream is just gorgeous. Sounds like John Roy Lynch would make a great text for teaching meaningful punctuation. Will have to check it out. Wonderful list, thanks. Thank you for the list of suggestions. I agree that we need more books that represent diverse people. I wish it were easier to find books involving people from diverse backgrounds that weren’t about the problem of diversity. Thanks, too, for pointing out that these books aren’t just for use in February–learning about people of diverse backgrounds needs to happen all year! What a fabulous list. 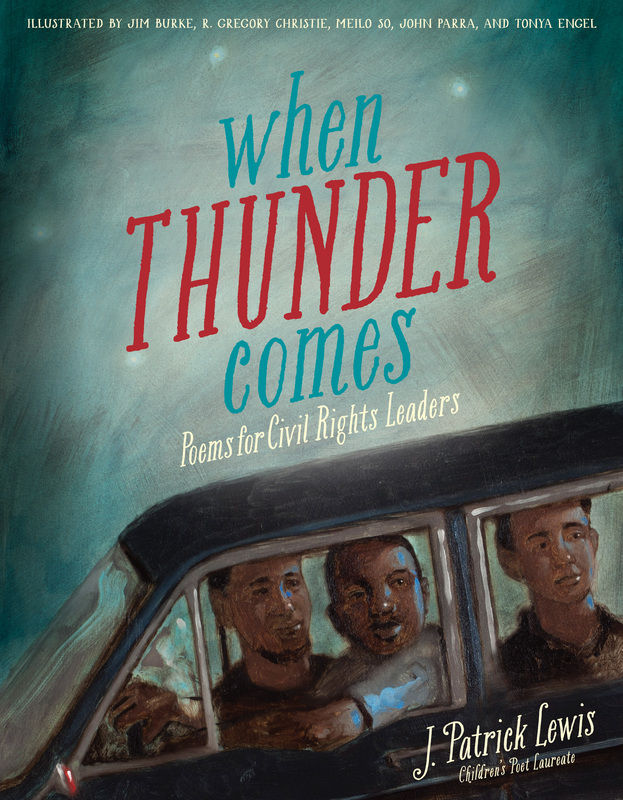 We are finishing up our civil rights unit and When Thunder Comes looks like a great title to add to my collection. What a great list of books that every reader and writer should read. I plan on sharing this list with the teachers that I coach. I just added them to my Amazon cart. Thank you for sharing!!! Would love to share these books with my students. Thank you for sharing this list. What a terrific list, and such thoughtful commentary on these titles, Stacey — thank you so much for including The Amazing Age of John Roy Lynch among them. Whoever wins my book, I hope you love it! I am in the process of earning a teaching credential and I am so thankful to have come across this wonderful gathering of books. I am committed to creating a truly multicultural and RICH cultural classroom library in my future room. Should you draw my name for a book giveaway, I would be very interested in a copy of the “When Thunder Comes” or “28 Days.” All of these books look great and bring fresh voices and beautiful artwork to stimulate young learners. 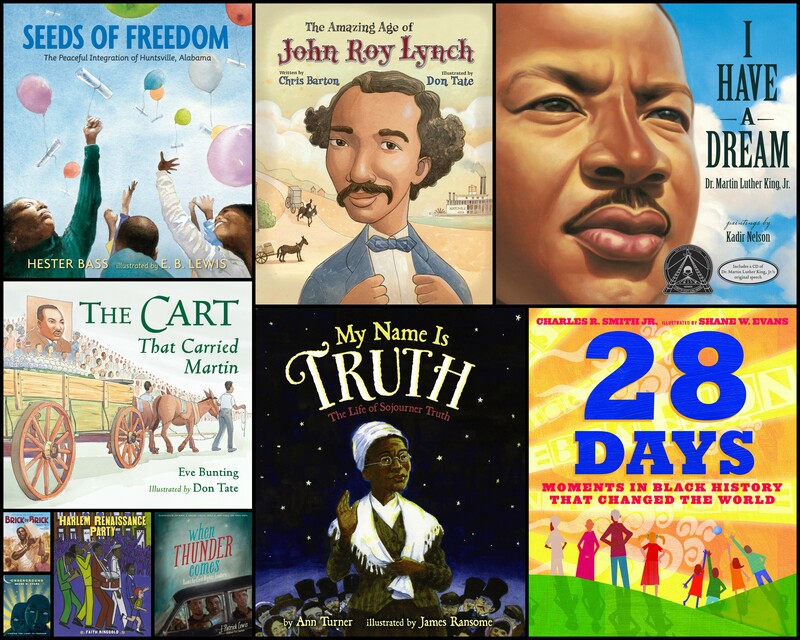 This is such an amazing website and these look like great mentor texts to teach about black history month. These sound like wonderful books. I appreciate the list and teaching suggestions! I am going to bookmark this page to return to again and again! Thank You! So many great suggestions…some I haven’t read yet myself – will definitely check out some of your picks – thanks for putting your list together! These books look great for readers and writers workshops. I am always looking for alternative books for great conversations, and showing histroy in more realistic, inclusionary ways and formats. They are fabulous! Like all of the books I recommend, these can do double- and triple-duty (i.e., reading workshop demo text, writing workshop mentor text, and social studies read aloud). Thank you for sharing this list of books and the great teaching ideas! I wish I had this sooner. I can’t wait ti sample these books and update our selections for our school. I must research these titles further. I have a class this year that kept pushing me further around Martin Luther King Jr’s birthday. More about the whys and who. The book: Seeds of Freedom caught my eye in this list. In January, one of the most powerful conversations we had wasn’t on Martin Luther King Jr. himself, it was on the lunch counter sit ins. Beautiful post. Thank you. Thanks for sharing such a great list and describing them in detail. I would be happy to add any or all to my collection! I enjoyed your reviews! I love hearing the description that students need ” mirror books and window books”…so many students in my class need more window books! I’d love to add The Cart That Carried Martin or the Harlem Renissance Party to my classroom library! I love this blog post and believe we should put good literature in the hands of students everyday! This mind set embraces growth and life long learning no one could ever take away! The ones that I would love the most are 28 Days, Harlem Renaissance Party, Brick by Brick, The Amazing Age of John Roy Lynch, and I Hear Thunder. I’d be thrilled to win any of these lovely gems! Very interesting post! Wow! These look amazing. I will have to check my local library to see which they have. these look lovely and fit into my 3rd grade biography unit with grace ! I’m most excited about the my Name is Truth and John Roy Lynch books!! Thanks for the list! Any of these books would be awesome to use in the classroom!! Thank you! Thanks for joining us and putting together an interesting collection. Biographies do tell facts that might be unknown. I was reading one that didn’t make my post today about Thomas Jefferson and learned while he said slavery should be stopped had 150 slaves at his personal home after being president. So interesting and great for bringing history to life. They all look great, but I can’t wait to check out Brick by Brick. I really love all of the tips on how the books can be used as mentor texts. I’ve taught in urban settings for many years and have collected African American history books. I’d love 28 Days, John Roy Lynch, or Seeds of Change. Fabulous selection, Stacey – love all the teaching ideas you’ve shared as well. There are so many thought provoking titles in your list. Thank you for sharing these nonfiction books and suggestions for their use as mentor texts. You’ve given us much to think about in this valuable resource. What a great list of books. I would love to have these for my classroom! I love this gIveaway! Any of these books would be awesome in my library! Thanks, this list will come in handy for our African American Read-In. For details about the Read-In, check out the Twenty-Sixth National African American Read-In Website sponsored by the Black Caucus of NCTE. Love the annotations and ideas to use as mentor texts! What a great list of books. I love the “We Need Diverse Books” campaign. Our library did a display of books for this campaign. I love making students aware of new books they can read. What a fantastic list of books! I love the mentor text ideas. My sixth graders and I are embarking on a new unit. We will be writing graphic novels to culminate our ancient civilization research. I want my students to focus on the image that they create. They will also need to be quite frugal with their words. I think that Underground might be just the book to illustrate this idea. Thank you for your posts. They are always the first thing I read each day! Thank you so much for taking the time to curate these beautiful resources. Wonderful books to share with my teachers! (I’m a coach). Thanks for sharing them- along with the ideas of how they can be used as mentor text! As a librarian on the international border between the U.S. and Mexico, I am always on the lookout for books about racial diversity and history. What a glorious addition to my library one of these books would make! the diversity of our city, military and border town, never ceases to amaze me. Please choose me!!!! I love all that you wrote about the books, Stacey. Wonderful books, great giveaway too. If I got to choose, I’d love the Bunting book, The Cart That Carried Martin or Seeds for Change. Thanks! Aw, I am never going to break even this year! The books that you post are always so incredible, and spark so many ideas for lessons and enrichment that my brain would look like a welding project on a brain scan right now! These titles dovetail nicely into my units at this time of the year. We talk, read and write about Civil Rights, segregation, prejudice, and overcoming difficulties. Whether I win or not, I will be heading to the bookstore! 28 Days would be my choice, although any title would be wonderful. I am in Portland, Oregon. Such excellent texts! I would love to have a copy of When Thunder Comes. It is so hard to find great, meaningful poetry to share with young students. To be able to share the message that we have “thunder” inside us is such an added bonus! The book Underground also looks wonderful! It would be a fantastic added resource to books like Henry’s Freedom Box to help children understand such a powerful, but difficult concept for 21st century learners. I would love to have any one of these fabulous books. They would be great to share with teachers at upcoming district staff development days! You always have such great books to recommend! Eve Bunting is amazing, that would be my first pick, but truly any title would be a gem. These books look very engaging, and I think students will love them. My book wish list just got a little bit longer!!!! One of the most powerful books we used this year was Unspoken…a wordless but very detailed picture book about the underground railroad. 2nd-4th graders responded deeply to this one! Love all these books. Have been following your blog for a while and love the lists of books you suggest as well as the many ways to use the titles as mentor texts for our young writers. What an amazing collection of text! Many of these titles have been on my radar. I’d love to be able to share them with the teachers at my school. What a fabulous collection of books! A bonus to any classroom library – as read aloud, mentor texts, and for students to sit, read, and share. What wonderful choices! They are sure to enrich the library of any classroom. What a rich collection with so many possibilities for instruction. Thanks for compiling such a thorough list. Have you seen the Cybils poetry book winner, Voices from the March on Washington? It would be another one to add to this list. I have and it is wonderful! These look like beautiful books. A great addition to any classroom. As a fourth grade teacher, we study the Underground Railroad in Indiana History. I would love a copy of Underground to use for both reading and writing! Thanks for the giveaway! I’d love to win My Name is Truth. So many wonderful new titles I am not familiar with. I am such an Eve Bunting fan, and that one is going in my cart right now. You selections are always impeccable. Speaking of Eve Bunting, check out her upcoming book, Yard Sale, which is coming out in March or April. I read it to a class of third graders yesterday as a great example of show not tell and they LOVED it! Love the ” mentor text possibilities” sections for each. 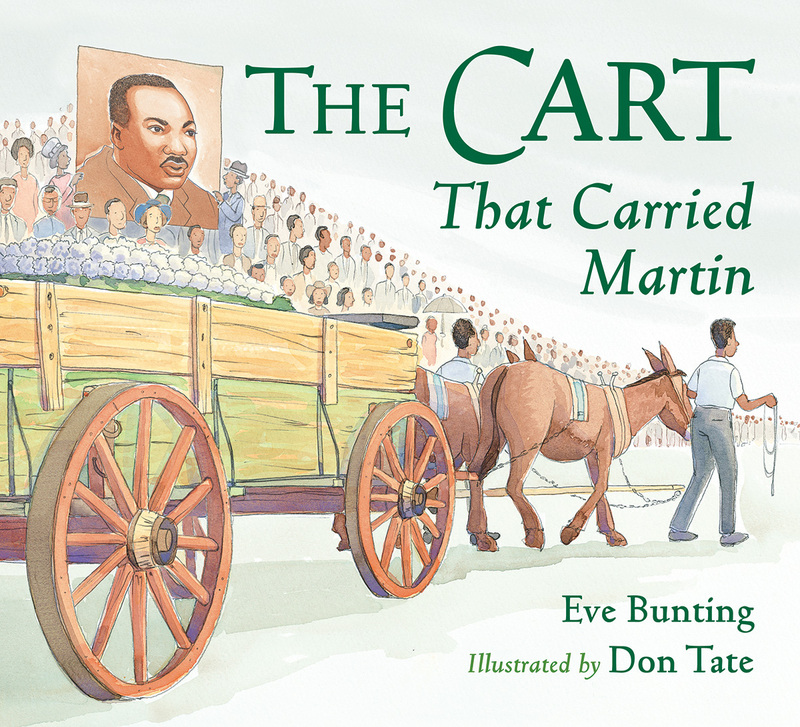 I had no idea that Eve Bunting wrote The Cart That Carried Martin. Will have to check that one out! Thanks for a great list. Thanks for sharing. I teach 6th graders and have been adding on-level nonfiction picture books to our classroom library all year. It’s an interesting selection of books about an important part of your history. I agree with you that they should not only be read in February. The phrase that jumped out at me was encouraging students to write about little known stories. On top of that….my brain was working overtime on the thought that slaves built the White House and I never knew that! Brick by Brick would definitely be high on the list for me. This is a great idea! 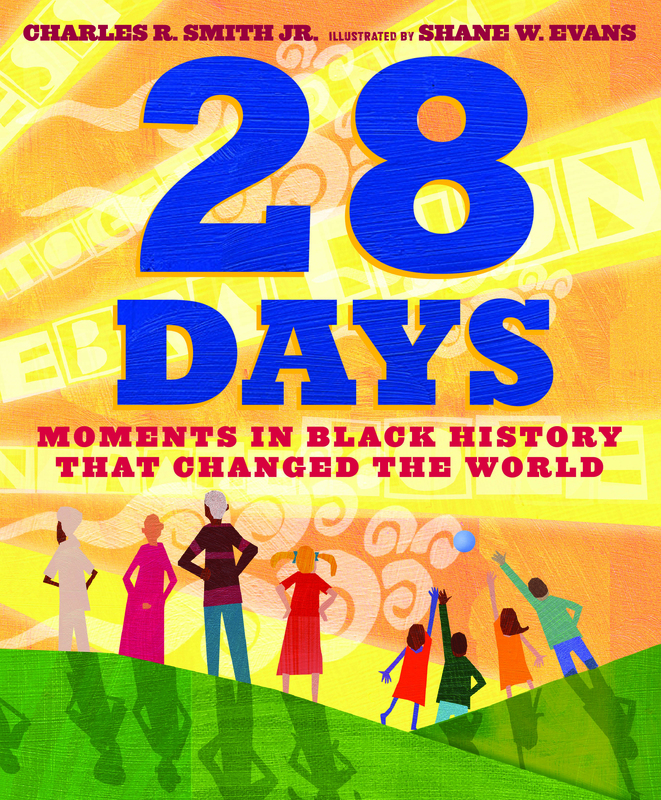 Thank you for the opportunity to win 🙂 I would be fine with any of the books honestly, but I think that “28 days: moments in black history that changed the world” is a great book because many children and adults have very limited information about black history so it would be interesting to hear other stories. Oh, and Seeds of Freedom or Harlem Renaissance Party are both high up on the must get list. Thanks for all of the ideas for more books to add to our collection of African American History and those who inspire with great individual collective actions and achievements from many different time periods of US history. We are currently researching several African Americans who achieved despite segregation and limits on what they were able to do and where. It warms my heart to see the titles here that connect the dots for young people who often do not get this exposure to our history or who get a fragmented sense of various people in very different contexts. Thanks. All these books sound so good I honestly couldn’t select one to wish for more than any other. Looks like I have several book titles to add to my shopping list. Thanks for sharing!